Steve Moyers (L) with the California Surf in 1980. Photo courtesy of NASLjerseys.com. A scoring star in a league that did not provide many Americans with the opportunity to be so, Steve Moyers stands as an example of what might have been, and the type of American player who might have been developed, if the North American Soccer League continued down the “grassroots” path of the early 1970s instead of lunging for “major league” status after the arrival of Pelé in 1975. Moyers was born on September 23, 1956 in, like many American soccer stars of the early 80s, St. Louis, Missouri. Not surprisingly, given the city’s soccer-rich history and traditions, Moyers took up the sport at an early age. At 5’10”, Moyers’ quickly developed a knack for being at the right place and at the right time, an instinct that tended to elude most American footballers at the time. Moyers once scored six goals in a high school match. An all-around athlete, Moyers also did well in tennis and baseball. Moyers played only one year of college soccer with the University of Missouri-St. Louis, earning all-Midwest honors at the time. He grew bored with the college game, however, and set his aim on bigger targets. In 1977, Moyers attended an open tryout with the St. Louis Stars, his hometown’s entry in the North American Soccer League. At the time, the Stars were the only team in the league making any effort to allow American-born players to actually play in the league. Even with this policy, however, Moyers had his work cut out for him: the Stars had Denny Vaninger, John Stremlau, Al Trost, and several other American stars on their roster, and were not likely to be overly impressed with a 21-year old with only one year of college soccer experience. Moyers beat the odds, and made the club as a walk-on. In fact, Moyers even worked his way into the starting line-up, and was paired with Vaninger at forward on opening day. Moyers made a name for himself by scoring two goals against the Haitian National Team in an exhibition match. This led to two more starts late in the season, with Moyers scoring a goal in his second match. In 1978, the Stars pulled up roots and moved to California. Moyers made the move with the franchise, and started in the franchise’s first regular season game in Anaheim. Moyers played in 26 games that year, starting 14 of them, and posted a respectable 7 goals. He was also the club’s second leading scorer for the year. More exciting for Surf fans was the fact that Moyers got stronger as the season progressed, scoring six of those goals in his last seven games. The following year had all the earmarks of being the “Blond Bomber”’s breakout year. Able to unleash a powerful shot with either foot, and a rugged presence in the penalty area, it seemed that Moyers would develop into that rarest of creatures: an American who was not only playing striker, but also consistently able to score goals. However, his progress was derailed by a fluke accident that almost cost him, not just his career, but his life. During a preseason training session, Moyers chested a ball that somehow caused one of his lungs to collapse. Moyers lay on the ground, struggling for air, when goalkeeper Dave Jokerst came over and gave the younger forward mouth-to-mouth resuscitation, a move that literally saved Moyers’ life. Other players might have been sidelined for months, or even the season, by such an injury. Moyers, however, was ready to play soccer within a week. In fact, he was in the starting lineup during the team’s opener, and scored two goals against Dallas on April 28. However, he never really got on track in the 1979 season, and was relegated to a substitute’s role by mid-season. Fortunately, Moyers was able to avail himself of a previously unavailable opportunity to redeem his 1979: Following the success of the Major Indoor Soccer League with indoor soccer, the NASL decided to stage its own indoor slate of games for the 1979-80 season. California was one of the teams participating, and Moyers developed into one of the team’s more reliable scorers, grabbing 10 goals in 12 games. For a change, however, Moyers caught some breaks. In the first minute of the Surf’s opener, defender Steve Feeney was injured, and Moyers sent in to replace him. Moyers wound up scoring the winning goal in that match, and netted two goals two games later. Moyers grabbed another two goals in his next match, and scored one goal apiece in his next two games. Another goal two games later gave him eight goals in eight games. Seven of those goals came on headers. Moyers suffered a leg injury on May 21, causing him to miss the next four games. It was typical of the disrespect shown to American players that Moyers–off to such a great start–lost his starting job as a result. His next four matches saw him filling the familiar substitute’s role. Moyers scored in his first start after the injury, however, and scored again in his very next match. Moyers was not able to sustain his scoring pace, and fell from the league leaders. Ultimately, he wasn’t even the highest scoring American-born player in the league, that honor going the Seattle forward Mark Peterson. But Moyers still established himself as one of the bright American lights of pro soccer. 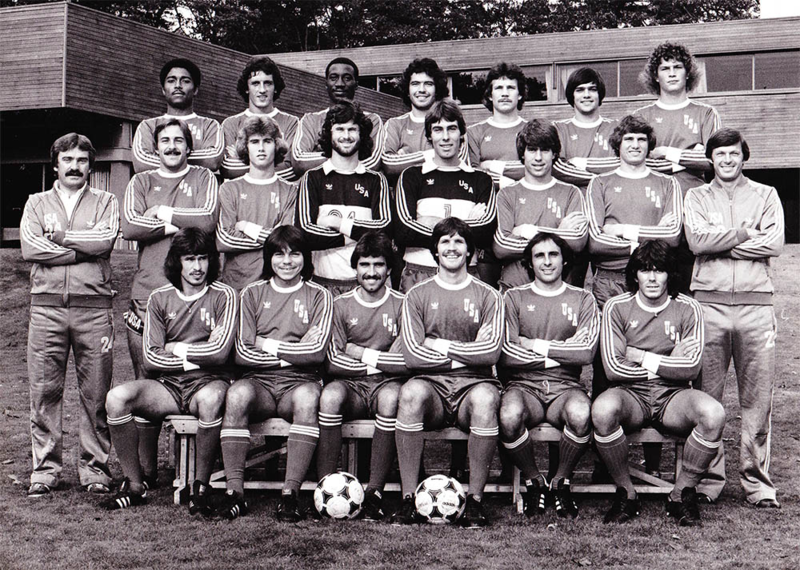 The 1980 US national team. That winter, Moyers again ventured indoors as part of the NASL’s indoor soccer season. Moyers continued to add to his newly minted reputation as a lethal finisher, grabbing 19 goals in 16 games. Moyers was handed a starting position in 1981 and never let go, leading all American scorers with 11 goals and six assists. The Surf missed the playoffs, however, and crumbling fan support led the team to go out of business at the end of the season. Ironically, this led to the biggest break in Moyers’ career. California, along with Calgary, Los Angeles, Minnesota, Washington, and Dallas, folded at the close of the 1981 season. This contraction, coupled with the loss of Atlanta, Detroit, Houston, Memphis, and Rochester the year before, effectively sounded the death knell of the NASL, which had expanded too rapidly after the 1977 season. In any event, all of the players from those clubs were placed in a dispersal draft. Enter the most famous American team of the time: the New York Cosmos were, for the first time, participating in the NASL’s indoor season for 1981-82. Since most of their outdoor stars would opt to pass up playing the unfamiliar game, the Cosmos needed to stock their indoor roster with some top players. Conveniently, Moyers was available, and the Cosmos picked him up. Moyers was somewhat ambivalent about the move; he had hoped to land with Ft. Lauderdale, and San Diego and Chicago were also very interested in his skills. The Cosmos, on the other hand, made it clear that they were signing him, at least initially, for the indoor season only. Moyers was not interested in becoming an indoor-only player, and turned down an offer to join the MISL’s St. Louis Steamers as a result. Thus, almost by accident, Moyers was a Cosmo. “Help them” he did: with 20 goals and 10 assists, Moyers was the second-leading scorer on a team that was but a shell of its outdoor self. As a reward, Moyers was signed for the 1982 outdoor season. 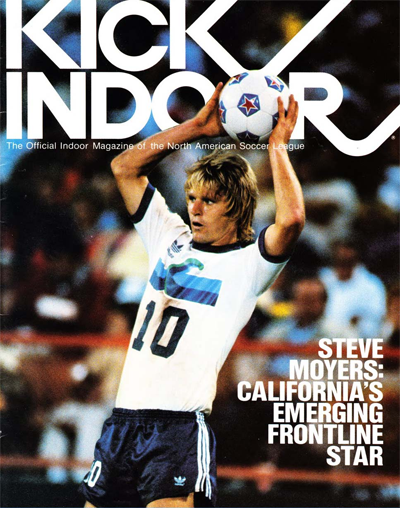 Moyers was not in Anaheim anymore; on the depth chart, Moyers was behind four-time NASL scoring champion Giorgio Chinaglia (who would also win the 1982 scoring crown); up-and-coming striker Roberto Cabanas; winger Steve Hunt; and former Rowdies star Steve Wegerle. Moyers started out as a substitute, but scored two goals in his first start. Moyers started 15 games in a row after that, scoring 7 goals. He then was relegated to the bench, scoring three goals as a “super-sub.” All told, Moyers finished second on the team in scoring, but had to watch as the Cosmos won their fifth (and last) North American Soccer League title because of a back injury. Since the NASL did not play an indoor season in 1982-83, Moyers had the winter off. Well, not really: this being the Cosmos, there were various exhibition tours, with the team travelling to Australia, South Korea and Japan. In 1983, the Cosmos were again favored to win the NASL title, in no small part because of the presence of Moyers. Although known primarily for their international stars, the Cosmos also boasted an impressive array of American talent: Moyers, Ricky Davis, and Jeff Durgan were among the best Yanks in the league. The Cosmos would find themselves without Durgan for the 1983 season, because of a strange experiment on the part of the league. Desperate to qualify for the 1986 World Cup, the U.S. National Team needed to play a regular schedule. This was necessary because most U.S. National Team players were, incredibly, not good enough to start for their NASL clubs. As a result, the NASL placed a team in Washington called Team America, to be made up of U.S. National Team players. Although Durgan jumped to Team America, most American starters — such as Moyers and Davis — stayed with their club teams. As a result, Team America was a dismal failure, and one that caused hard feeling between the American players. Durgan felt that every American player had an obligation to play for the team, and roundly criticized Moyers, Davis, and other stars such as Seattle’s Mark Peterson for staying with their clubs. (Peterson, for his part, was “guilted” into finishing the season with Team America). New York rolled with the punches and rolled to another division title. For the first time in his outdoor career, Moyers was a full-time starter. Not used to playing a full ninety-minute game, Moyers got off to a sluggish start. Also, Moyers was not seeing as much of the ball as he perhaps should have: along with Chinaglia, Moyers had to share space with Roberto Cabanas, on his way to a 25-goal season and the NASL scoring title. Ironically, once Chinaglia went down with an injury, Moyers began getting more scoring opportunities. Moyers scored 12 of his 15 goals in the final 17 games, all after Chinaglia got hurt. Moyers finished in the top 10 of leading scorers for the first time in his career. Unfortunately, Montreal shocked the Cosmos in the first round of the playoffs, depriving Moyers of an opportunity to play in an NASL final. Afterwards, Moyers and the Cosmos geared up for another indoor season. 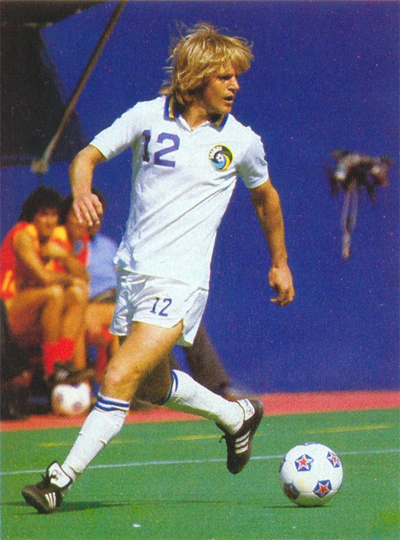 While the Cosmos had treated the prior two NASL indoor seasons as little more than exhibitions, this season found them bringing in many of their star players as they made a run at the indoor title. New York almost succeeded, making it to the finals before losing to San Diego. The season found Moyers again starting slowly, and he broke his wrist in December. After missing six games, Moyers returned and began scoring goals in bunches, totaling 30 for the season. He was also designated captain in mid season. The honor inspired him to score 18 goals in his final 12 matches. Heading into 1984, New York was again the prohibitive favorite to win the NASL title. Indeed, the successful indoor campaign seemed to foreshadow another dominant outdoor campaign. However, the wheels came off the franchise that season; Moyers, due to injury and the temperamental Eddie Firmani serving as coach, saw action in only 8 games, netting a single goal. The mighty Cosmos finished in last place. As it is, the NASL was on the verge of collapse, as well. In fact, several NASL teams jumped to the Major Indoor Soccer League, with the Cosmos being one of them. Given Moyers’ past proficiency indoors, it was expected that he would lead the team back to the playoffs. Still battling injury, Moyers managed a respectable 5 goals in 13 games before the unthinkable happened. After a decade of being America’s premier professional soccer team, the Cosmos folded mid-season. This was the first time in modern professional soccer history that a major league franchise went out of business mid-season, and was a major embarrassment for the MISL. Moyers, however, was still a hot commodity, and was quickly signed by his hometown team, the St. Louis Steamers. The Steamers had been a great success on the field and at the gate, utilizing a team composed almost exclusively of Americans, and primarily St. Louis natives at that. Moyers appeared to be a perfect fit. However, he could only manage one goal in 11 games, and was released after the season. It’s hard to say why Moyers’ production seemingly disappeared overnight. He was a very physical player, and relied on strength as much as skill to score goals. A series of nagging injuries combined to deprive him of some of his strength, and his effectiveness faded as a result. After a year off, Moyers signed with the Canton Invaders of the American Indoor Soccer League, at the time a feeder league for the MISL. Splitting his season between Canton and the Milwaukee Wave, Moyers showed flashes of his old form, netting 25 goals in 29 games. Given the quality of play in the AISL, however, many expected Moyers to do much better; leading scorer Rudy Pikuzinski scored 51 goals in 42 games, for example. Not receiving any offers from MISL teams, Moyers called it a career. Moyers finished as the all-time leading American-born goal scorer in the North American Soccer League, and finished 17th on the all-time NASL goal scoring list. He was capped nine times by the U.S. National Team, including all three games in the 1984 Olympics and the U.S.’s surprising 0-0 draw with defending World Cup champions Italy in 1984. He scored two goals with the National Team, both in the game against Mexico. Philadelphia labor attorney and soccer coach, player, sabermetrician and historian. Follow him on Twitter at @Section107RowA. Steve, great article about Steve Moyers. Great guy and great player! It gives a small insight of what it was to be an American player trying to get established in our American Leagues, (NASL-MISL). Most importantly it shows the love, passion, overcoming all adversities that Steve and all of us had to play and make soccer what it is today. Imagine, me playing in “The Circle” in Harrison Gardens, then in “The Courts”, (akin to playing basketball and “Making Your Bones” in Harlem’s Rucker Park), and 35 years later they would build a soccer specific stadium in Harrison, N.J. The crazy thing is I watched it being built over the years, USMNT, NY Cosmos and Hall of Famer, Philadelphia Atoms and 2 time NY Cosmos Champion Bobby Smith, Santiago Formoso, (The Courts Best forward) USMNT and NY Cosmos Champion, Kevin Welsh, teammate at NE Tea-Men, Hugh, (Shug), O’Neill, (NASL Hartford, Memphis Rogues, ASL Charlotte Champion were at the groundbreaking of the stadium and I and my friends have never been asked by any one from the Red Bulls to be honored for all we gave and sacrificed to help make the MLS and the USMNT what it is today. Through people like yourself and others, the USSF, MLS must reach out and bring the extra-ordinary stories to build bridges and teach the history so the “New School” players/fans can connect and utilize the wisdom of the “Old School” players/coaches/front office to build a true “American Soccer Cultural Community” and Our own American Style of play, I call it “GENIUS SOCCER” AMERICA. The Best of The Best. The Best players, coaches, Pele, Cruyff, Beckenbauer, Carlos Alberto, George Best, Bobby Moore, Gordon Banks, Dettmar Cramer, Rinus Michels, Bobby Smith, Santiago Formoso, Al Trost, Shep Messing, etc. etc. and our own style of play that is reflective of the American people and our beautiful, passionate, skillful, and love of The Beautiful Game! It is amazing how far we have come and where we will be in the next 25 years! Top Soccer League in the World! World Cup Champions in 2022! FORZA USA,USMNT and USWNT!